A structured rehabilitation program is important for optimum recovery from a calf strain. We outline an example of a calf strain rehab schedule below for grade 1,2 and 3 injuries. This rehabilitation programme is intended as a guide only. We recommend seeking professional advice before carrying out any form of exercise. All timelines are given as an indication only. Rest as much as possible. Apply ice or even better a cold therapy and compression wrap – this should be applied for 15 minutes every 2-3 hours. Make sure you wrap the ice in a wet towel to prevent skin burns. Compression – apply a compression bandage, calf support or elastic tubi-grip type bandage to help reduce swelling and bleeding. Elevation – put your feet up and read about treatment and rehabilitation of your injury. Elevating the leg will help swelling and blood run away from the injured muscle. If it is comfortable do Calf strain stretching exercises very gently, 3-5 times a day. Start with active stretching and if an exercise is painful do not do it. Visit a sports massage therapist who can perform calf strain sports massage techniques. Electrotherapy such as ultrasound may also be beneficial in reducing swelling and relaxing the muscle. Continue to rest from any aggravating activities. 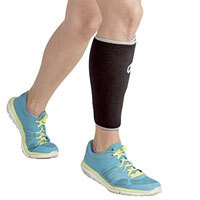 Continue to wear a compression bandage or calf support. Continue to stretch on a daily basis. A calf stretcher is a useful piece of kit to aid the stretching the calf muscle in the later stages of rehabilitation. Continue with sports massage as necessary. As the muscle gets stronger then massage techniques will become deeper and the time between treatments longer. Begin calf strain strengthening exercises. Resistance bands can be used initially, followed by calf raises and then eventually single leg calf raises. Remember not to do any exercises if they are painful. Once you can achieve 3 sets of 20 single leg calf raises, pain-free gradually incorporate running into the rehab program. Eventually, plyometrics or hopping exercises should be done to return to full match fitness and prevent the injury recurring. Expert Interview: Physiotherapy Consultant Neal Reynolds explains the later stages of calf muscle rehabilitation. Rest as much as possible – use crutches if necessary. Ice – this should be applied for 15 minutes every 2-3 hours. Make sure you wrap the ice in a wet towel to prevent skin burns. Compression – apply a compression bandage or tubi-grip bandage to help reduce swelling and bleeding. Elevation – put your feet up and read about treatment and rehabilitation of your injury. Elevating the leg will help swelling and blood run away from the injured muscle. Once it is comfortable to do so, perform some active stretches – pull your toes towards you, hold for 2-3 seconds and then relax and repeat 10-20 times. If you are walking, try using heel pads to temporarily shorten the calf muscles and take the strain off them. Continue to wear the compression bandage. Continue to rest from any aggravating activities. If it is comfortable to do so try to gently stretch both calf muscles 3-5 times a day. Instead of icing, try alternating hot and cold for 5 minutes each, for 20-30 minutes 3 times a day. Visit a sports injury professional for a sports massage. Electrotherapy may also be beneficial. Start to gently strengthen the calf muscles if it is comfortable to do so. Start with resistance band plantarflexion and progress to calf raises and then single leg calf raises. Continue to stretch regularly. Continue with sports massage if necessary. Gradually incorporate some running into your program once you can achieve 3 sets of 20 single leg calf raises, pain-free! Stop playing and rest immediately. If you are concerned that the muscle may be ruptured, go straight to a Doctor or Hospital. If the muscle is ruptured or there is considerable damage the usual treatment involves an operation to repair the muscle. If the muscle is not completely torn, follow a grade 2 program.